The Bank of PNG (BPNG) made an illegal payment of a K102 million dividend in 2014 to the O’Neill Government. This was in breach of its establishing law the Central Banking Act. Even more troubling was that this dividend payment was made when the BPNG was technically insolvent. I touched on this in my column in the Sunday Chronicle on 21 May 2017 (see here) and I now set out more details. Section 49(3) of the Central Banking Act (see here for a copy) states that the payment of a dividend to the State is prohibited if the total assets of BPNG are less than the sum of its liabilities and paid-up capital (which I will call a dividend payable position). To see if this condition is present all we need to do is look at the Bank of PNG’s balance sheet, extract these numbers and do the arithmetic. paid-up capital remained unchanged at K146 million. Table 1 summarizes this and shows that there was negative dividend payable position. In other words the sum of liabilities and paid-up capital exceeded total assets by K447 million. So by law a dividend payment was not allowed. There are reserve accounts in the BPNG balance sheets but Section 50 (1) states that profits arising from revaluation or exchange rate movements (essentially unrealized gains) are not available for distribution as a dividend to the State. In any case when the reserves are taking into account there is an even worse position for the BPNG with the net asset deficiency positions of K593 million and K555 million for 2013 and 2014 respectively (see row E of Table 1 and Figure 1). That is the BPNG was technically insolvent in those years, indeed the BPNG itself notes this on page 42 of the 2013 Annual Report and page 44 of the 2014 Annual Report. It is troubling to see reported in the 2014 Annual Report (page 70) that the BPNG Board recognized that it could not pay a dividend as this “would be in contravention of the Act” but the Government nonetheless directed the BPNG to pay and then issued a promissory note of K1.12 billion in return. The capitulation of the Board of the BPNG in paying the dividend of K102 million runs contrary to its establishing Act, indeed this is explicitly recorded in the 2014 Annual Report statement (page 70), which states that the “Government of Papua New Guinea is restricted under the Central Banking Act 2000 in actively participating in Bank’s decision and policy formulations”. The promissory note is a legal instrument that captures a promise by the Government to pay K1.12 billion when demanded by BPNG. However, the note cannot actually be called on demand as there are a number of stringent requirements before it can be paid by the Government. 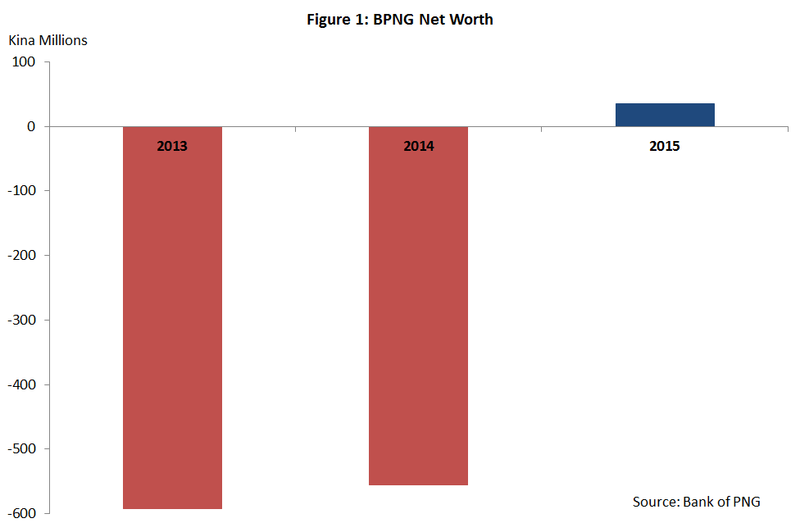 This makes it a contingent asset and under the financial accounting standards adopted by the Bank it cannot be booked in the BPNG’s balance sheet – as is the case for the Financial Statements for 2014 where the Bank’s net worth position remained negative (see Figure 1). I will discuss the promissory note in a subsequent post in a little more detail. I need to assuage fears that the financial sector will come crashing down if the BPNG is insolvent. The BPNG is not like an ordinary private company. Whilst private companies can be forced into bankruptcy no such proceedings apply to BPNG. Whereas liabilities in a private company allow claim to its assets, the liabilities of BPNG are mainly money supply and it can settle debt easily by printing more money. So BPNG can’t really go bankrupt but excessive printing of money has adverse outcomes on inflation and the exchange rate. Despite the technical insolvency BPNG was and is still able to operate. It has positive cash flow that allows it to meet its operational and other costs. BPNG amongst its various responsibilities is a regulator of the financial services sector and claims to employ best practice in financial sector supervision. It is also responsible for the conduct of monetary and exchange rate policy as well as implementing a safe and efficient national payments system. The reputation and credibility of Central Banks are of paramount importance in the roles it plays. Is the credibility of BPNG to supervise and ensure the financial health of entities within the financial services sector not undermined when it has scant regard for its own governing law? Is the credibility of BPNG not undermined when it seeks to impose fit and proper tests for board directors of companies it supervises but yet the BPNG’s directors fail to adhere to law when making board decisions? When a key State institution, an independent central bank no less, cannot uphold its own law then it begs the question of how our domestic stakeholders and overseas investors will have confidence in the management of our economy, public finances, the monetary sector and financial sector? The breach of law is unacceptable and those responsible must be held to account. 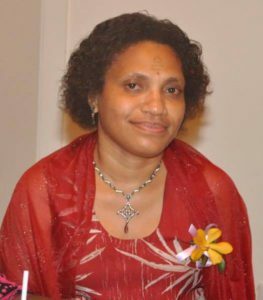 The first breach was by Board of Directors of the Bank of PNG. Directors have a fiduciary duty to act in the best interest of the BPNG and an explicit responsibility to ensure compliance with the Central Banking Act. The Board of BPNG acted unlawfully in approving the payment of a dividend in 2014 on the basis of the financial performance over 2013. Members of the Board at that time and including especially the Executive Chairman of the Board should be held to account. The second breach was by the O’Neill Government. Why did the National Executive Council insist on the payment of a K102 million dividend when it was advised that it was prohibited by law? Questions should be asked of O’Neill (the Prime Minister and Chairman of NEC) and Pruaitch (the Treasurer at the time) as to why the BPNG Board was made to break the law. It seems clear that they should especially be held accountable. How long will the Government continue depending on Quantitative Easing? Must we continue on creating money out of thin air? Must we be like Greece or the United States of America? Thanks Kessy for the insights. In fact I was very curious why BPNG was enticing SME to buy “I think bonds’ worth K10 000 and up. I mean the argument was good – to encourage the savings culture but I had that feeling that BPNG is kinda ‘desperate’ and is looking at every possible option. Not sure my thoughts are accurate; correct me if am wrong.